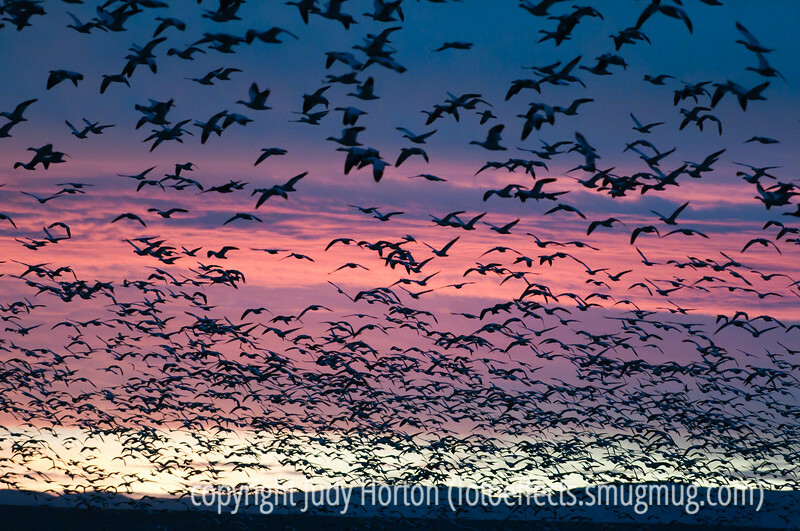 The morning flyout of snow geese at Bosque del Apache National Wildlife Refuge in NM. This is actually a tiny proportion of the snow geese that were part of the main flyout. When that happens, the sky is pretty much covered totally with birds. There are some shots of that in my "Birds" gallery. They're not as interesting as photos, but they are pretty interesting in terms of understanding the flyout event. I was amazed by your response to my shot of the cookware with the reflections. Some of you wondered where I was, since I didn't show up much in the reflections. I was off a bit to the side. Unfortunately, that nice cookware is not mine. I took the shot at Williams Sonoma. Hope your week started well and that you have a great day! It's too bad we can have a sound button on these photographs, people would not believe the noise. Stunning nature still and great painted sky! I was there last year and you have capture the sight perfectly. One has to be there to hear 10,000 geese fly over. Beautiful color. The birds are like a lace curtain over the delicious layers of color in the sky. Love, love, love this. Love the layers of colour overlaid by the flock of geese! Wouldn't want to be directly under that flock for sure. Brings back memories of a game I played when very young...Duck, Duck Goose...but with a whole new meaning!!! Beautiful! Love the layers of color.